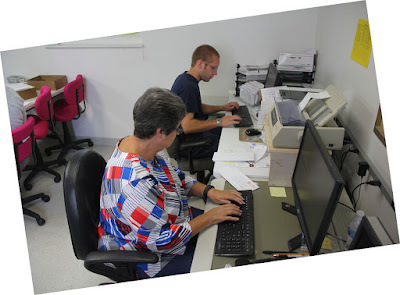 Today Dave B and Cindy entered Bible requests on the computer while Mary G and Carol R worked on studies while I worked in the other room making copies and filling boxes. After a couple hours Dave came in to report all of the request had been entered. The printer was checked to see if their were labels in the drawer, the preview was checked and the button that says print clicked. As soon as the printer stopped the clear button was pushed so I could enter one more label but this time when the print button was clicked, 3 pages came out of the printer instead of just one with one name on it. What was worse for some reason 2 pages full of names had merged into one page so it had 2 sets of names and numbers on each label. There was no way to read the names or numbers of the labels. All of the envelopes were removed from the garbage and each name checked. At least I wasn't dumpster diving, just picking through one of our garbage cans and that only had the envelopes and letters from yesterday. If the name was correctly printed on one of the 3 good sheets it was thrown away again but if not it was marked for printing later and by the time the pile had been gone through 40 minutes had passed but all of the Bible labels, that is all 5 sheets of labels were printed and are ready for tomorrow. Now that was just plain weird we have never had something like that happen before and I sure hope it doesn't happen again. Ellen reported that we have a pretty full box of mail for tomorrow. IF anyone has some free time we could use help opening and processing mail.